The day that corn could fix its own nitrogen would be sweet, indeed. The day that corn could fix its own nitrogen would be sweet, indeed. It would save growers plenty of money on fertilizer and it would help the environment by decreasing opportunities for nitrogen (N) runoff and volatilization. It would also revolutionize food production in parts of the world where farmers cannot afford high levels of industrial inputs. Despite limited success in finding bacterial strains that boosted corn yields, researchers may have greater success in genetically engineering N-fixing bacteria and corn that work together. Legumes such as beans, peas and alfalfa have long been known for their symbioses with N-fixing root nodule bacteria. Less well known is the discovery by researchers in Brazil that some sugar cane varieties receive a majority of their required N from bacteria. In sugar cane, the bacteria live within the plant roots, stalks, and leaves, in the spaces between the plant cells, rather than forming root nodules. This discovery has spurred people to look for similar bacteria that might provide N to other important grass crops such as wheat and corn. He thinks the yield increase in corn may have had more to do with plant hormone production, explaining, “A lot of these bacteria make plant hormones, especially auxins, and they could be playing a role.” Although Triplett did not test this idea, it has been noted in other work on similar plant–bacteria associations. For example, his laboratory has developed the equivalent of amplifiers that work in bacteria. “Just like you could hook up an electrical amplifier to your iPod and make it sound louder, you could take this little amplifier module and stick it inside a gene regulatory system and change how the signal gets transmitted across that amplifier. So a small signal can get translated to a larger output downstream of the amplifier,” he adds. Bhalerao thinks that corn could be engineered to produce soybean-like chemical signals to attract N-fixing root nodule bacteria. Conversely, N-fixing bacteria could be engineered to respond to chemicals the corn already produces. Bhalerao and five other investigators from four other universities are in the first year of a three-year grant from the US National Science Foundation to begin exploring these possibilities. Although he does not expect to have a prototype allowing corn to fix its own N by the end of the grant, he hopes that they will have answered a number of questions about its feasibility. A group of Canadian collaborators, including Drs. Lining Tian and Lana Reid from Agriculture and Agri-Food Canada (AAFC), Dr. Peter Pauls from the University of Guelph, and Dr. Zhongmin Dong from St. Mary’s University in Halifax, have also been exploring the possibility of introducing N fixation into corn. With funding from AAFC, Pioneer Hi-Bred Canada, and the Ontario Ministry of Agriculture, Food, and Rural Affairs, they have started by testing the ability of a major N-fixing bacterium from sugar cane to colonize Canadian sweet corn and grain corn hybrids. They think that introducing a bacterium from a related grass like sugar cane is a better possibility than getting root nodule bacteria to work with corn. In their greenhouse tests, the sugar cane bacterium colonized 11 of 17 grain corn lines and nine of 10 sweet corn lines tested. It proliferated and moved throughout the plant tissue during one month of plant growth. 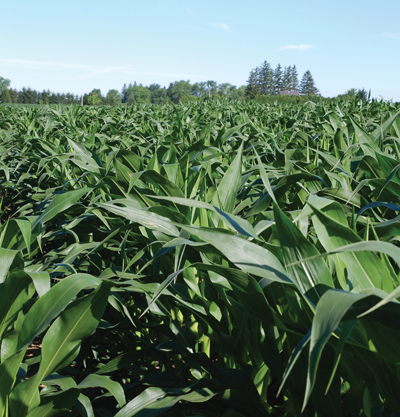 Now that the researchers know they can get the bacterium to colonize some Canadian corn hybrids, one of the next steps will be to see if they can detect any N-fixing activity in the plants. They also hope to get funding to investigate how the plant and bacterial genes are involved in the N fixation.